All best wishes for a happy and very creative 2019 from your SOFAAR board. It is a New Year’s Day tradition to bring in the new. So what projects are you going to start today or for 2019 ? Please send an e-mail to info@sofaar.ca and let us know. We would love to hear from you all and publish your responses in the next Snippets newsletter. We have lots planned for 2019! 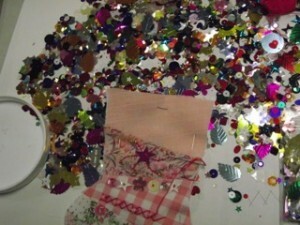 The first event coming up is our (now) regular monthly “Saturday Snips” gathering. We will be gathering on Saturday, January 12th from 1 to 4 pm at the Paradise Community Hall in Paradise right at 10300 Highway One. We hope to see you there with some show and tell and your dreams for projects for 2019. There will be a Saturday gathering every month and you can see the next ones appearing on our “Events” page. March 9th will be bring our annual general meeting and our now famous Stash sale and give away. April brings a new event of community outreach at the Annapolis Royal Firehall. This event is called “Snips and Scraps” and will focus on waste fibres and how to use them. This is April 13th and we would love to have as many SOFAAR member as possible attend to showcase how they work with waste fibres to keep them out of the landfill. We hope you will participate. Please let us know. These are just some of our events planned for 2019. There will also be a members’ exhibit at the Museum in Middleton this summer so today is perhaps a good day to start a piece for that. Your board is always open to ideas and suggestions and you are welcome to write to us at anytime. 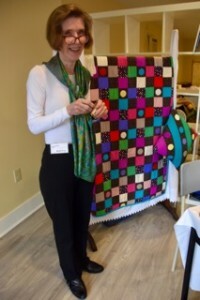 On December 8th at the Christmas “Saturday Snips” social, the draw for Marilyn Preus’s beautiful silk quilt and pillow was held. The lucky winner is Françoise Trottier of Bridgetown. We are thrilled that Françoise won the quilt as she is, herself, not only a quilter but a fan of Marilyn’s work. The quilt has gone to a very appreciative home. SOFAAR would like to thank all those who purchased tickets on the quilt. The money raised will go towards programming and workshops for SOFAAR members. 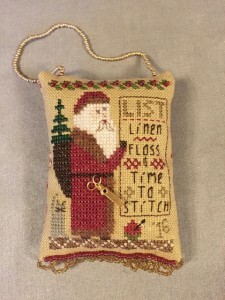 The social was well attended and a very interesting show and tell of members’ work took place including some of the miniature stockings from our workshop in November. We hope to see many of you at our next Saturday snips event on January 12th at the Brickton community hall. The silk quilt won by Françoise Trottier. 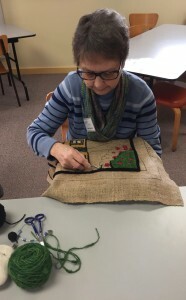 Fifteen SOFAAR members spent a very agreeable Sunday afternoon on November 25th learning how to make a delightful little Christmas crazy stocking under the patient and watchful eye of instructor Kay den Hartog. 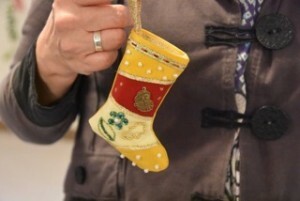 We all hope to have our little creations to show at SOFAAR’s next gathering on December 8th. Many thanks to Kay and to Céleste for all their help and clearly printed patterns. 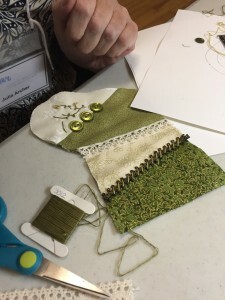 Thanks also to Céleste for sharing her silk stash and to all participants for sharing bits of lace, fabric, buttons and beads and all manner of shiny bits! Rachael made us all tea and coffee and provided snacks and we were very grateful to have a break as the afternoon whizzed by and we admired everyone’s handiwork. 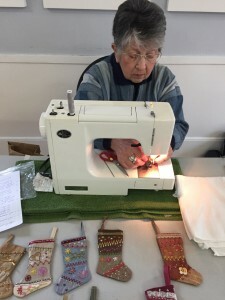 Kay demonstrating at her machine behind some of her own creations. We progress under Kay’s watchful eye. 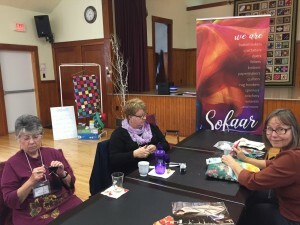 About 17 SOFAAR members met on Saturday October 13th to work on projects and show them off at the Paradise Hall. Lots of tasty treats and wonderful work to look at. Everyone working away with fibre!. 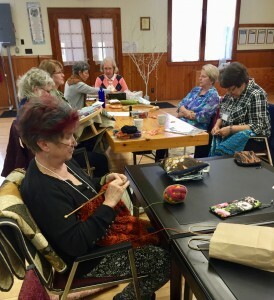 Join us at the Paradise Community Hall from 1 to 4 pm on Saturday, October 13th for an afternoon of stitching and fibre crafting. Bring your current project or a show and tell and share an afternoon with like-minded fibre enthusiasts! Working away on finishing a project! 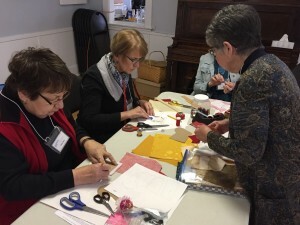 This 4th annual Maritime Lace Day takes place on October 6th from 10 am to 4 pm at the Caribou Community Hall in Caribou River, NS. Attendees are invited to bring their lunch and show and tell of all things lace. The event is open to the public from 2 to 4 pm to see bobbin lace being made. Special guest Gary Wood will be demonstrating the turning of wooden bobbins. And there will be a lace supplies for sale. 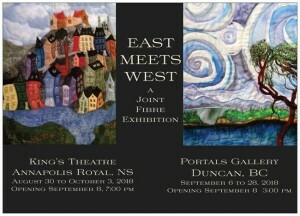 Not one but two wonderful fibre exhibits to see in the month of September. Opening receptions are the weekend of September 8th and 9th. East meets West is a joint exhibit with the Vancouver Surface Design Association. This exhibit will be at the King’s Theatre Lobby from August 30th to November 3th. The opening reception will take place on Saturday evening, September 8th at 7 pm and will be joined via video link with the opening at the Portal’s Gallery in Ducan BC. 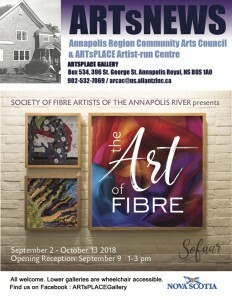 The Art of Fibre is a SOFAAR members’ exhibit taking place at the Chapel Gallery at ARCAC in Annapolis Royal from September 2nd to October 13th, 2018. The opening reception will take place Sunday afternoon, September 9th from 1 – 3 pm. 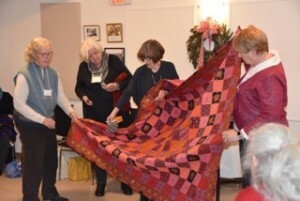 SOFAAR has been donated a gorgeous pure silk quilt created by Marilyn Preus valued at at least $2,500.00. 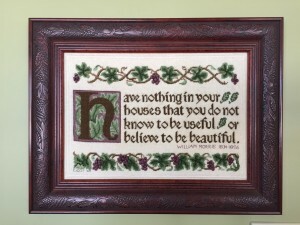 We are selling tickets for this wonderful quilt (and matching square pillow) at $5.00 each. We have recently obtained a permit from council to set up on market days every other week in the small courtyard across from the market, directly adjacent to King’s theatre. You can purchase tickets at the market or contact info@sofaar.ca to purchase tickets. The draw will take place December 6th at our Christmas fibre gathering.